The Mars Society is pleased to announce that the 22nd Annual International Mars Society Convention will be convened Thursday-Sunday, October 17-20, 2019 on the campus of the University of Southern California (USC) in Los Angeles. The four-day event is being held in concert with the Southern California Commercial Spaceflight Initiative . The Mars Society conference will bring together prominent scientists, policymakers, entrepreneurs, journalists and space advocates to discuss the significance of the latest scientific discoveries, technological advances and political-economic-social developments that could impact on plans for the human exploration and settlement of the planet Mars. The theme of the 2019 convention will be The Space Revolution: Opening the Way to Mars, detailing the impact that the ongoing world-wide space launch revolution is having on preparation for human Mars exploration. The agenda will also include a variety of plenary talks, panel discussions and public debates concerning key issues bearing on human Mars exploration. Conference highlights will include the latest exploratory results from the Curiosity and InSight missions and the Mars Express, ExoMars Trace Gas, Mars Reconnaissance and MAVEN orbiters. In addition, there will be updates on the upcoming ExoMars and Mars 2020 missions and a recount of the Opportunity rover’s many accomplishments on the Red Planet. The final face-off of the Mars Colony Design Contest, in which ten finalists drawn from around the world will present their creative designs for a 1,000 person Mars settlement before a panel of eminent judges and the international space community. A discussion on how SpaceX’s fast-moving program to create the reusable Starship heavy lift launch vehicle could serve to open the way to exploring the Red Planet and beyond. The annual keynote address and evening entertainment during the Saturday banquet. A detailed presentation about the 2018-19 crew simulations at the Mars Desert Research Station (MDRS) in southern Utah and planning for the next crew mission to the Flashline Mars Arctic Research Station (FMARS) in northern Canada. 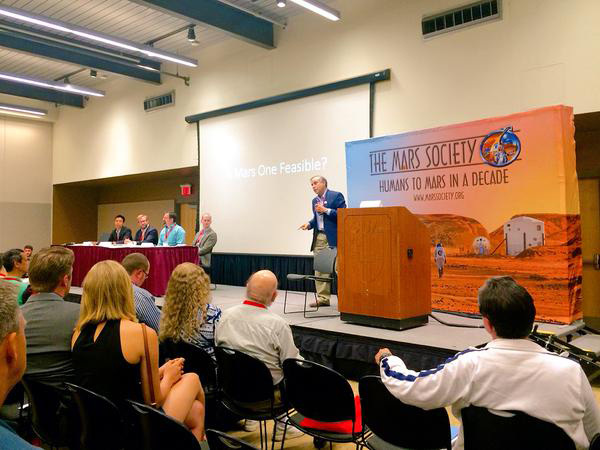 Previous Mars Society conventions have drawn hundreds of participants from all over the world and have received extensive national and international press coverage. This year’s conference should be one of the most exciting and interesting events to date. We hope that you’ll join us! To register for the 22nd Annual International Mars Society Convention, including early bird special rates, please visit: http://www.marssociety.org/convention-registration. Also for convention updates in the coming weeks and months, please visit our web site: www.marssociety.org. Presentations for the 22nd Annual International Mars Society Convention in October are invited dealing with all matters (science, engineering, politics, economics, public policy, etc.) associated with the exploration and settlement of Mars. Abstracts of no more than 300 words should be sent by Sunday, June 30th, 5:00 pm MST. Those submissions received after the deadline will not be included in the printed convention literature and are lower priority for adding to the final schedule.